One of its biggest Arts series ever to be commissioned for BBC One, The Seven Ages Of Britain is a landmark seven part history of Britain's greatest art and artefacts over 2000 years. Written and presented by the ubiquitous David Dimbleby each hour-long episode focusing on a different period in the nation’s past. 1. Age of Conquest (AD 43 – 1066): Britain's story through art and treasure, from the Roman invasion to the Norman Conquest. 2. Age of Worship (1170 – 1400): Britain's art from the murder of Thomas Becket in 1170 to the death of Richard II in 1400. 3. Age of Power (1509 – 1609): Spanning from Henry VIII's accession in 1509 to Shakespeare's Henry VIII 100 years later. 4. Age of Revolution (1603 – 1708): In the 17th century British people learned to question everything, resulting in civil war. 5. Age of Money (1700 – 1805): The story of Britain in the 18th century, as a new 'middle' class emerged. 6. Age of Empire (1770 – 1911): The story of the British Empire from 1750 to 1900, revealed through its art and treasures. 7. Age of Ambition (1914 – Present): A look at how the 20th century saw Britons upturning class hierarchies. 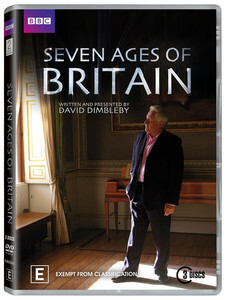 Seven Ages follows on from the success of David Dimbleby's previous two BBC One landmark Arts series, A Picture Of Britain – which traced the history of landscape painting, and How We Built Britain, a history of British architecture, the latter being one of the first Arts programmes to reach 5 million viewers. The new series looks at Great Britain’s extraordinary past through the Arts – both as objects that have often played a decisive part in events and as marvels of their age. Almost unparalleled in scope, the series sets itself the monumentally ambitious aim of charting 2000 years of British artistry, architecture and invention and, it must be said, over the course of its three discs it entirely succeeds in doing so. The series doesn’t sugercoat the terror and conquest inherent in Britain’s colonial past, but there’s beauty too, and a wondrous cavalcade of historical riches, from the works of Shakespeare to exquisite examples of Indian architecture conceived during the centuries of British rule. Anglophiles rejoice; the series really is as good as its viewing figures and reviews from old Blighty would suggest. None, but with a seven hour feature runtime there’s little cause for complaint. The 16:9 widescreen transfer is, like the presentation and subject matter, rather stunning, with a sharp and vibrant image permeating throughout. The Dolby Digital soundtrack is a 2.0, but proves clear, balanced and more than adequate. English SDH subtitles are also included.